The Soilmec SM-16GT is a hydraulic drilling rig designed specifically for geothermal drilling. The rig is crawler-mounted and widely used for ground source heat pump drilling on residential and commercial sites responding to the demand of geothermal systems drilling between 100 and 250 metres. The SM-16GT’s characteristics mean it can satisfy 70% of demand from the low-enthalpy geothermal sector. The compact drilling rig has a rubber tracked, 2300 mm-wide carriage and very low ground bearing pressure (0.65 Kg/cm2), thereby minimising damage to private property (gardens and courtyards) where domestic geothermal energy is used. The drilling rig is equipped with fixed kinematic mechanism with a wide section mast, half-cylinder pull/push and a 19.5 ton pull capacity and 9.8 ton push power. 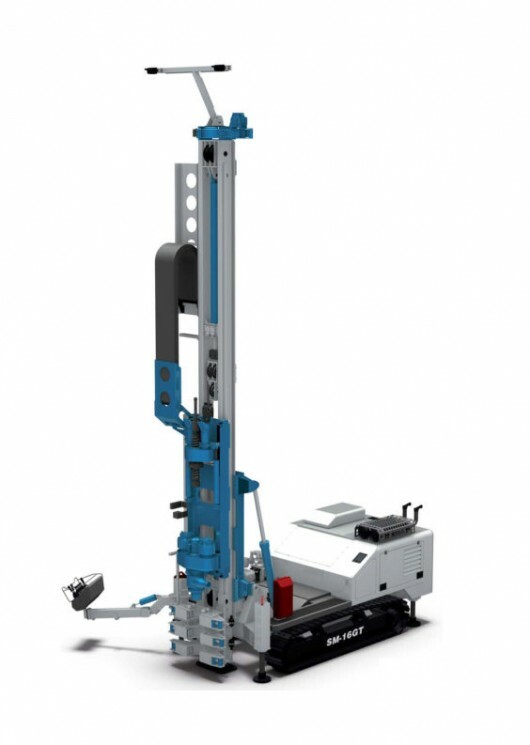 The rig is designed for rapid manoeuvring (0.2÷0,6 m/sec) and has a 200 kW, 2400 rpm diesel engine adapted to power the double rotary (upper 1100 daNm – bottom 3200 daNm), triple clamp and magnetic loading system to simultaneously manoeuvre rods/casings. To keep weight to a minimum the drilling rig is not fitted with heavy and bulky casing/rod storage and is instead accompanied by an autonomous motorised rack system during operation.